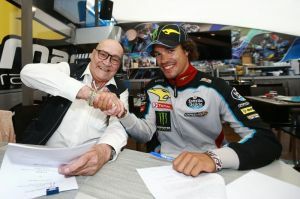 Franco Morbidelli will step up to the premier MotoGP category in 2018, after agreeing a contract extension with Team Estrella Galicia 0,0 Marc VDS in Assen today. Morbidelli, who leads the Moto2 World Championship, will remain with Team Estrella Galicia 0,0 Marc VDS for a further two years. The agreement reached today also includes an option for a third year, should the Italian wish to continue with the team for the 2020 MotoGP season. Morbidelli made his debut for Team Estrella Galicia 0,0 Marc VDS in 2016, securing eight podium finishes on his way to fourth place in the Moto2 World Championship. While a first World Championship win proved elusive in 2016, Morbidelli started the 2017 season with victory in Qatar, which he then backed up with further race wins in Argentina, Austin, Le Mans and The Netherlands. Morbidelli currently leads the Moto2 World Championship by twelve points from Thomas Lüthi after eight of 18 races.